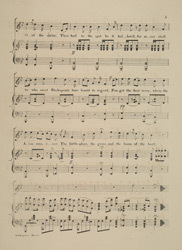 Sheet music for 'The Birth-place & Home Of The Bard', a music hall song written for the Shakespeare Festival in 1864. The actor David Garrick went to Stratford Upon Avon and to celebrate, a three day celebration of Shakespeare and his work was organised. From then on it became an annual event. The improvements in railway transport made the town more accessible, and workers had additional leisure time after bank holidays were introduced, so large numbers of people began to visit Stratford. The lyrics in this song are very clever and venerate the playwright in an almost religious way, talking of Shakespeare's lowly birth and his humble beginnings.